AVID Jazz presents three classic Stan Getz albums - plus, including original LP liner notes on a finely re-mastered and low priced double CD. 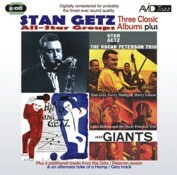 'Stan Getz & The Oscar Peterson Trio', 'Hamp & Getz' and 'Jazz Giants' plus four additional tracks from Getz and Peterson and an outtake from the Hamp- Getz album. We guess you could say that this collection of classic albums follows the theme of our super-group idea with the recent Lionel Hampton release. For our first selection, the meeting of the cool Stan Getz and the perhaps more traditional Oscar Peterson Trio would certainly rate as a meeting of jazz superstars, take a listen and find out! The old meets the new with our next album as Stan Getz joins Lionel Hampton following a meeting of the two during sessions for the Benny Goodman Movie soundtrack. The difference in styles and musical theories seem to evaporate as the two giants are joined by Shelley Manne, Lou Levy and Leroy Vinnegar. Finally we have 'Jazz Giants' which as they say, does what it says on the tin...namely, features a true super-group of jazz musicians and again joins the old with the new in a scintillating session. Here Getz is again joined by the Oscar Peterson Trio alongside Gerry Mulligan from the new school and Harry Edison and Louis Bellson from the old. We think you will agree the session achieved Mulligans stated aim 'to organise a unit composed of some of the older jazzmen and those of the younger musicians who can do it. It would be a fine opportunity to play and create together'. All three albums (plus) have been digitally re-mastered for probably the finest sound quality ever!